Both of these images are of the same ring! Artisan crafted incised intaglio artwork is featured our one of a kind, sterling silver Amber ring. 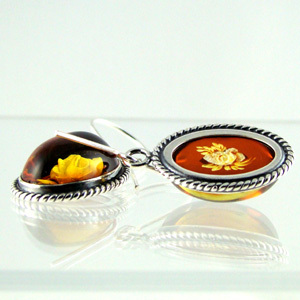 Intaglio is negative or reverse image-making in gemstone jewelry. 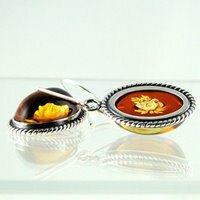 Even though an artisan may craft two intaglio rings, in the same design, style, in a similar color piece of Amber, each is unique as it is entirely hand crafted. This is a very painstaking process, as there are very few artisans working in intaglio this being one of the hardest challenges for any gemstone carver to achieve 3D quality. The combination of a highly developed artistic ability, craft skill and many years of experience are needed to be able to create such elaborate flowers. This Intaglio carving is set in 925 sterling silver and only at Deco Belle. Copyright 2006-2013 Deco Belle Inc.